It’s a busy time of year, but we’re squeezing in one more challenge at Cards in Envy for the next two weeks. This time our theme is “Let it Snow”. Any images depicting snow, snowflakes, snowmen, etc. are suitable for the challenge. Just remember to keep your card A2 sized (4.25″ x 5.5″) and flat enough to be mailed at the regular first-class postage rate. I have to confess that I was running short on time before I needed to present my design team sample, so instead of making a card with a big snowy scene like I really wanted to do, I’ve simply used the Christmas card that my family is sending out this year… which, I must admit, is a revisit of a card I made earlier this year. I’ve made a few changes, mainly to the color scheme. This time I’ve heat embossed the sentiment in silver to coordinate with the silver snowflake eyelet. I’m sharing two photos here; the second one does a little better job of showing the silver shimmer mist that I sprayed on the ivory layer. In real life, when the light catches it just right, it really glistens. I actually did the Christmas cards in two different shades of blue because I didn’t have quite enough of each color to make all of the card bases I needed. On the bright side, I did not need to buy any new materials right before Christmas to make the cards this year! And it felt good to use a lot of those snowflake eyelets – I’ve had them for a very long time! Shopping Our Stash also has the “Let it Snow” theme going on, so I’m going to enter this card into their challenge. The Cards in Envy team has come up with some other great snowy ideas, so be sure to check them out! We hope you’ll share your own snowy card with us before the challenge closes. You have until 7:00 p.m. Eastern time Sunday, January 3, 2016 to link your card at the challenge post. Thanks for stopping by today! Fabulous card! 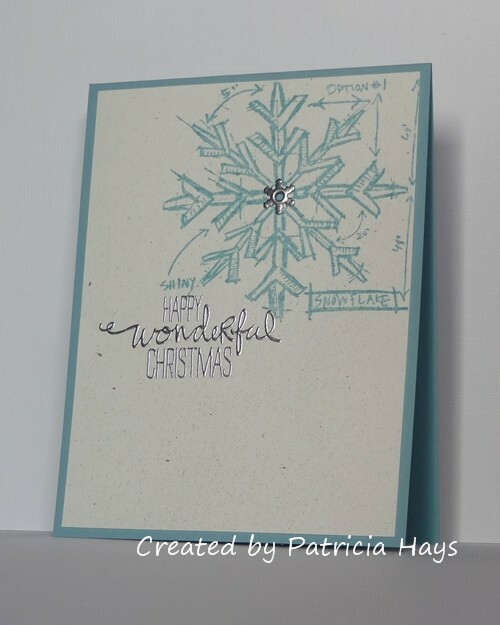 Love that Tim Holtz snowflake stamp! Thanks for joining the SHOPPING OUR STASH crew for “Let It Snow” challenge! This is gorgeous! I always admire those Tim Holtz blueprint stamps but never know what to do with them. By golly, you’ve rocked this one! Beautiful CAS Design! Nicely executed and presented! Thanks for taking the challenge this week here at 613 Avenue Create! Hi Patricia! I love this card! So elegant and clean! Have a merry Christmas! Hi Patricia! 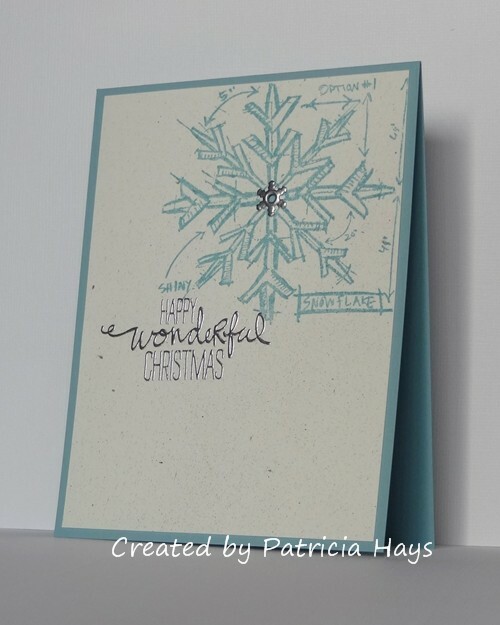 Your snowflake card is absolutely perfect! I love the silver touches and how you placed the focal point “off center”. It’s just so gorgeous! I hope you and your family have a very Merry Christmas and I look forward to staying in touch and continuing the fun together on the Cards In Envy Design Team! Hugs!